A Seattle artist who designed a line of plush pet toys called “Angry Birds” back in 2006 is now suing the company that sold them, claiming it cut her out of the process — and millions of dollars — when it licensed the design to the makers of the popular Angry Birds game. 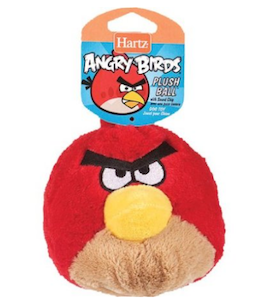 The woman filed her complaint yesterday in the U.S. District Court for the Western District of Washington, claiming that the Hartz Corporation didn’t have the right to sell her trademarked pet toys to game company Rovio. Her lawsuit says that in November 2006 she entered into a deal with Hartz to sell a line of pet toys called Angry Birds — featuring angry looking birds, what else? — which allowed the company to sell her toys in pet stores. But she says she kept the license for her intellectual property as part of the partnership, barring Hartz from licensing the trademark to anyone else. After the launch of the popular Angry Birds video game in December 2009, Hartz used [the artist’s] intellectual property and the trademarked “Angry Birds” name to leverage a deal with video game creator, Rovio, the suit states. The complaint adds that Hartz violated the agreement without [the plaintiff’s] knowledge and permission, and without ownership of her intellectual property or trademark. And while Rovio went after trademarks for a slew of other Angry Birds items, from clothes to board games, it didn’t even attempt to get a trademark for pet toys, likely because of its deal with Hartz, points out Joystiq. Rovio is not named in the lawsuit.